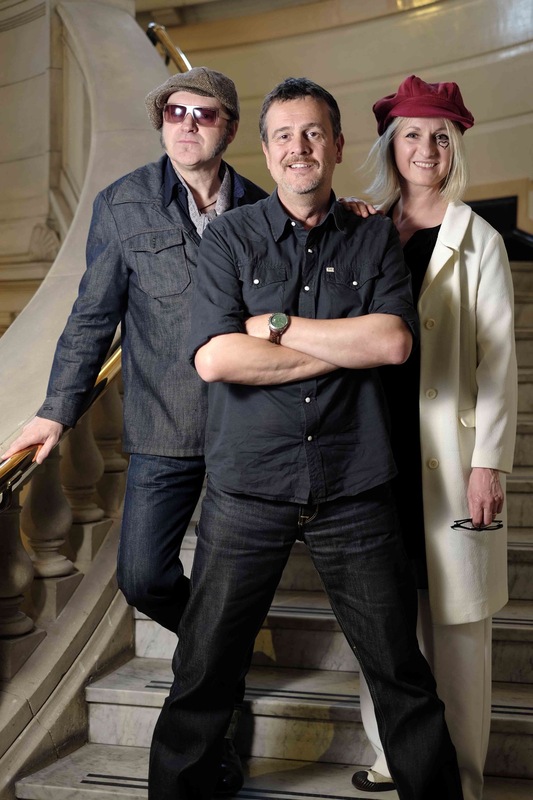 Best-selling crime writer Mark Billingham first heard country duo My Darling Clementine (Michael Weston King and Lou Dalgleish) when he read about them on my blog back in 2013. Since then he’s become a huge fan of the band – so much so that’s he’s recently collaborated with them on a new album and a touring live show called The Other Half. A story of love, loss and murder told in words and music, The Other Half is set in a rundown Memphis bar, and focuses on waitress Marcia – a former Las Vegas showgirl – who lives her life through her customers and their everyday, tragic tales of grief, heartbreak, lust, murder and domestic horror. So, what first attracted you to My Darling Clementine? 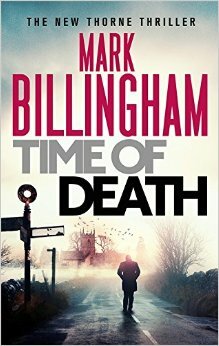 Mark Billingham: What’s not to love? The songs are wonderful and both Michael and Lou have voices to die for. I’ve always loved country duets – Tammy Wynette and George Jones, Dolly Parton and Porter Wagoner, Johnny Cash and June Carter – and My Darling Clementine are keeping that flame alive. They honour that tradition, but bring it bang up to date with songs that reflect the modern world. And, above all, they are amazing storytellers. We’ve talked before about the link between country music and crime fiction. You included a country music playlist, which featured My Darling Clementine, in your book, The Bones Beneath. How easy was it to link the two genres in The Other Half? You used some My Darling Clementine songs as stepping stones to writing the narrative, didn’t you? MB: Yes – the songs were very much the tent pegs around which I was able to construct the story. There were some songs I knew I wanted to use straight away – By A Thread, which opens the show, No Matter What Tammy Said (I Won’t Stand By Him) and, of course, The Other Half. This made it the easiest short story I’ve ever written. I’ve always found short fiction much tougher to write than novels, but having the songs to work with made it so much easier. How would you describe The Other Half? MB: It’s a story told in words and songs. One of the real delights of this project is that people have come along to the shows not really knowing what to expect and have come away having loved it. Both myself and My Darling Clementine are working outside our comfort zones and approaching our work in a new way and I think that excitement comes across. It’s a gig, it’s a play, it’s a story – it’s all those things, but the mixture of the three makes it something entirely of its own, too. Can you tell me about the writing process for The Other Half? How did you start it all off and come up with the concept of love, loss and murder in a Memphis bar and make it work with the My Darling Clementine songs? MB: The songs suggested characters – falling in and out of love, dealing with loss and grief – and it was my job to figure out who they were, how they had come to the point that Michael and Lou were singing about, or what happened to them afterwards. The bar seemed like the ideal setting for such a disparate bunch of characters and all I needed was someone through whose eyes we see them and that was where the character of Marcia the waitress came from. She is someone whose life has not panned out the way she imagined – a faded Vegas showgirl who now lives her life vicariously through her customers. A prime example of the process is No Matter What Tammy Said. It’s a hugely powerful song about a very dark subject and I was fired up to write about what happens to the people involved once the song has ended. So, Marcia observes these people, talks to the woman involved and through Michael and Lou singing the song, we discover the truth. Then I’m able to move the story on and this was my chance to bring murder into the picture, which, as a crime writer, I am of course contractually obliged to do. You’re a big fan of country music. What was it like working with My Darling Clementine in the studio and performing on stage? Did it take you back to your early days as a performer and doing comedy shows? Last year, I saw you sing and play guitar at The Other Half show in London, Islington. Are you a frustrated rock star? MB: Oh, of course. At heart I’m a performer and though these days my performances take place on the page, I can’t resist any opportunity to show off. I’m very comfortable on stage and it’s a real buzz sharing it with performers as great as Michael and Lou. It’s a huge pleasure hearing them sing every night and even though parts of the story are very dark, we have a lot of fun. The piece, as a whole, is actually uplifting, I think. You can’t put together a show about grief and pain and death without a degree of redemption. And I love having a chance to sing and sometimes play guitar with My Darling Clementine at the end of the night. MB: All those people were hugely generous with their time and very supportive of the project. David came in as a favour to do some acting on the album, as did the phenomenal Graham Parker. I’ve loved Graham’s stuff since I was 15, so to work with him was a huge thrill. He actually performed the show in its entirety – being me and reading the story – at a festival I couldn’t make in the Hague. So, when we were putting the album together, we asked him if he’d like to be involved and he said yes. You co-wrote a song with My Darling Clementine for The Other Half. What was that like? Was it a dream come true and would you like to write more lyrics? MB: Absolutely. I’m working on it. The idea was always to close the show with a new song that we had written together. It’s a song called As Precious As the Flame, which reflects the redemption I talked about earlier, and I love hearing it. I wrote some lyrics, which Michael and Lou improved, and then Michael wrote a fantastic tune. Seeing great actors play characters I’ve created is a buzz and hearing singers and players of Michael and Lou’s calibre singing my words is equally thrilling. What’s it like being on tour with a band? Have you picked up any rock and roll habits? MB: Of course. My rider is outrageous! It’s a very different life from that of the touring author. It involves a lot more preparation for a start. It’s not like rocking up at some bookshop or literary festival ten minutes before I’m due on stage and thinking I can busk it. 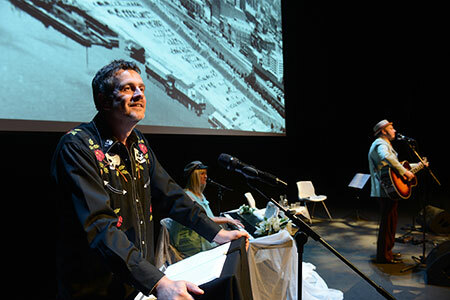 So, what’s next for Mark Billingham and My Darling Clementine? Are you going to be a new supergroup? Moving away from The Other Half, let’s talk about your new Tom Thorne novel, Time of Death, which came out recently. Without giving too much away, what’s it about? MB: As with the previous novel – The Bones Beneath – I’ve taken Tom Thorne out of London. This time, he and his girlfriend Helen Weeks have to travel back to the town where Helen grew up. Something bad has happened – of course – and for reasons Tom can’t quite understand, Helen feels compelled to return. A man has been arrested for the abduction of two girls, but Tom is not convinced the police have the right man. Obviously, he can’t resist poking his nose in where it’s not wanted and soon his friend Phil Hendricks turns up. You’re currently working on a new standalone novel that will be published next year, aren’t you? MB: Yes, I am. I’m giving Thorne a break, although, as with my previous standalone novels, he will make a cameo appearance. I’m about two thirds of the way through it, and I’m enjoying myself, but I have no idea if it’s any good or not. Once that’s done, I’ll be getting involved with the TV adaptations of Time Of Death and In The Dark, which are very exciting. They will be broadcast next year and there will be another series, based on an altogether different book, coming in 2017. Finally, as we’re talking about music and fiction, what are you currently listening to and reading? MB: I’m listening to a lot of old stuff, as always. Aside from the two fabulous My Darling Clementine albums and a lot of Graham Parker, I’m on a real Everly Brothers kick at the moment, so Songs Our Daddy Taught Us is being played almost constantly. The two recent albums that I’ve enjoyed the most have been Jenny Lewis’s The Voyager and Colfax by The Delines. Right now, I’m re-reading Peter Guralnick’s brilliant Last Train To Memphis (inspired by The Other Half, I think). Actually, I’ve been on a bit of a non-fiction kick recently and have loved So You’ve Been Publicly Shamed by Jon Ronson, Going Clear by Lawrence Wright and Do No Harm by Henry Marsh. My favourite novel of the last six months, hands down, has been Fourth Of July Creek by Smith Henderson. Gobsmackingly good. In terms of crime fiction, the best novel I’ve read recently is A Song Of Shadows by John Connolly and I’m very much looking forward to the new one from Dennis Lehane. The Other Half is now available on CD and as an audio download from Little, Brown. 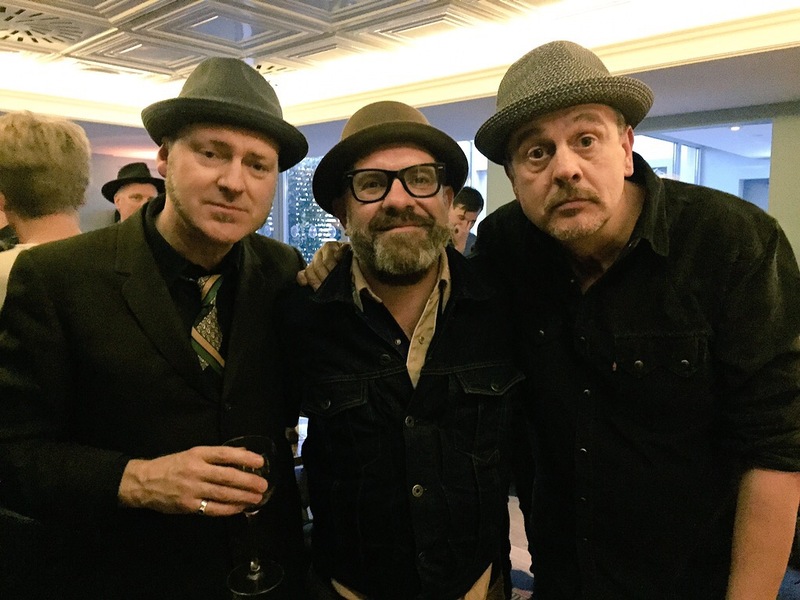 Recorded in January 2015, it contains brand new versions of eight My Darling Clementine songs, Mark Billingham’s narration, and features special guest performances from David Morrissey (who played Mark’s detective Tom Thorne on TV), singer-songwriter Graham Parker and the Brodsky Quartet. 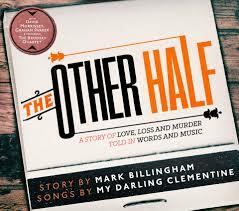 To read an interview with the other half of The Other Half, My Darling Clementine, please click here.